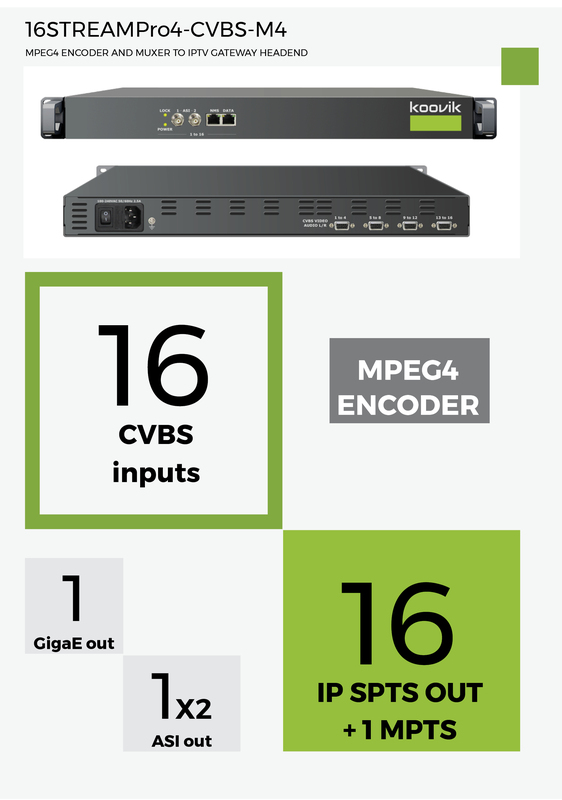 16 CVBS MPEG4 ENCODER inputs and MUXER. 16 IP SPTS and 2 MPTS outputs. 2 ASI outputs (copy of MPTS streams). BIT-RATE 1.0 Mbps to 7 Mbps. CBR or VBR. User selectable per each video input. IP SPTS 16 SPTS over UDP or RTP/RTSP. Unicast or Multicast. IP MPTS 1 MPTS with 16 x CVBS TS each, over UDP or RTP/RTSP. Unicast or Multicast. included 1 x mains cable, 1 x ground cable, 4 x D-SUB to RCA cables for 16 A/V signals, 1 x BNC male to BNC male.